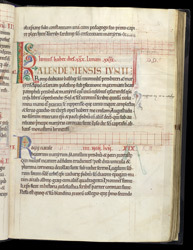 The calendar used the Roman system (kalends, nones and ides), this page beginning with the kalends (1) of June. It depended on lunar phases, the reason for stating the numbers of days and 'moons' here in red. The red letters and number in the margins coordinate with numbers and letters which should have been written in the two double horizontal bands--but never were--a system for calculating the weekday of the date in any year. If a saint's day fell on a Sunday or a major feast such as Good Friday, special services would have to be accomodated. On the 1 June the dedication of the basilica of St Nicomedus was commemorated, the martyrdom of Sts Marcellinus and Peter on 2 June (iiii non. Iun, 4th nones of June). The marginal note ("origenis") references another of the priory's manuscripts.